Last April, I went to London. I met up w. my friend Justin— and he introduced me to his friend Cliff. Cliff could not not have been nicer and his house- was just so homey- and he had this amazing garden outside w. fresh herbs etc. To top it off, he had worked on these British cooking shows! Could anything be more up my alley? We all watched a bunch- and I flipped through a cookbook from one of the shows–Cookery School? I took a bunch of pics w. my iphone (my favorite way to copy a recipe). Last wknd ending up making 2 of them– this and sticky toffee pudding (post to come.) And in a word— I’d call this dish satiating. Made for a great meal- brunch and dinner. People always talk about being so sick of chicken– but I will tell you that I rarely make it– and certainly not more than any other meat. True story– an acupuncturist told me that I should eat less chicken and turkey–because they were highly neurotic birds– and that might be, taking effect so to speak. So she advised to diversify. But this was so good- I will definitely be making again and again– neuroses be damned. I served w. 1 bunch broccoli rabe w lemon. Line cutting board w. a piece of saran wrap. Put a chicken breast down. Lay another piece of saran wrap on top. 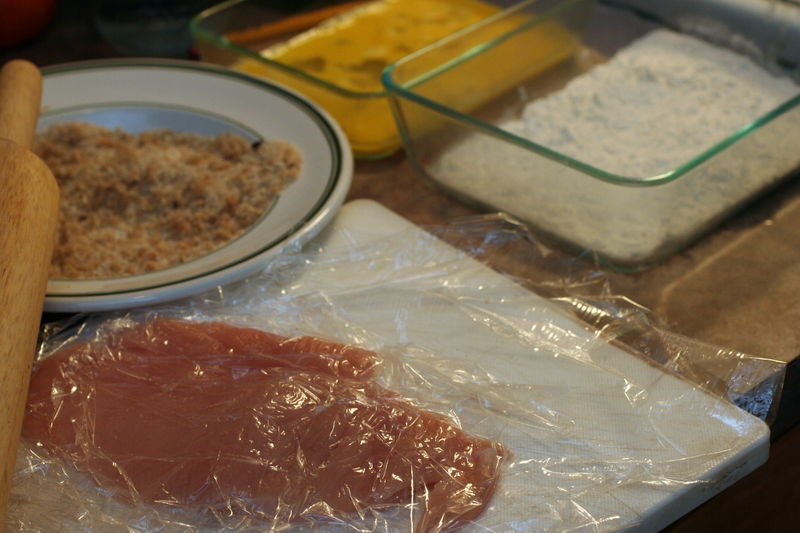 Using a rolling pin– or if you don’t have can use a heavy pan– bang down on chicken to flatten out (you will be surprised how easy this is). You want chicken to be about 1/2 an inch. Remove from saran and repeat w. other 3 breasts. Prep your counter w. 3 shallow bowls or plates (see below). One w. flour. One w. breadcrumbs. One w. eggs. Heat a large skillet. When hot, add 3 tablespoons of olive oil (enough for 2 breasts). Fry chicken for 2-3 minutes on each side until golden brown. Flip over and cook another 2 mins. Meanwhile, in a small pan fry capers. Heat one tablespoon of olive oil over medium heat. Add capers and fry for 3-4 minutes until they get crispy. Reusing one of the pans- heat remaining tablespoon of olive oil (obviously use less if making less eggs). When oil hot, crack eggs into pan. Cook 2-3 minutes. If you want to be pretty- you can use a cookie cutter to perfect the edges. To serve. Lay chicken down. Egg on top. Sprinkle capers over. If using, lay anchovies over egg. Lovely served w. wedges of lemon or simple salad. I served w. broccoli rabe. In large skillet, heated some oil and I threw broccoli in whole. Cover for a few minutes- maybe 5. Finish w. extra olive oil, salt, pepper and fresh squeezed lemon. 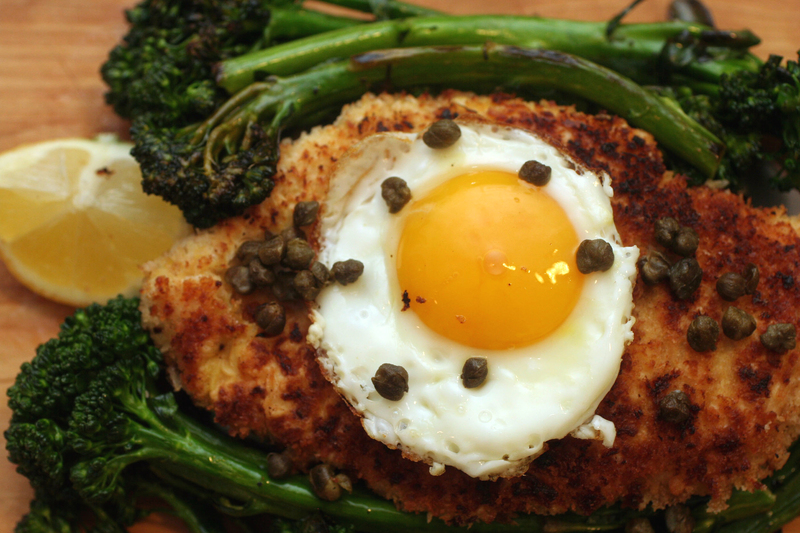 Obviously, if you have leftovers– fry the egg before you serve. Chicken and capers reheated nicely in oven– on cookie sheet for 500.